1 Preheat the oven to 200°C, gas mark 6. Toss the seeds in the paprika, oil and a little seasoning then tip into a roasting tin and toast in the oven for 5 minutes until crisp. Remove from the oven and leave to cool slightly. 2 In a small food processor, blitz the avocado with the buttermilk, Tabasco and lime zest and juice. Season to taste. 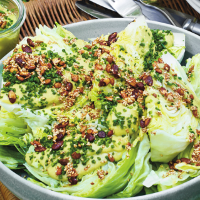 3 Place the lettuce wedges on a large serving plate, drizzle generously with the dressing, scatter with the chives and seeds, then serve.